Four Leaf Milling etc – Australian grown and freshly milled, certified organic grains, flours, pulses and seeds, South Australia. Now I stock an ever-increasing range of individually sourced ingredients from other Australian, organic farmers, including Rain-fed Rice, French-style Green Lentils, whole Red Lentils, Tasmanian Spelt, Linseed and Quinoa. Plus I make a beautiful, organic, gluten free muesli which turns the gluten free breakfast into a joy! L’Abruzzese Pasta – Australian grown and made, certified organic pastas, SA. Patlin Gardens Olives and Oil – Uncertified organic olives and olive oils from SA. Willunga Almonds – South Australian grown, uncertified organic Johnston almonds, SA. Pistachios – From Mark in S.A. Organic, toasted and lightly salted. Brazil nuts – Bolivia. Organic and very fresh. Hazelnuts – Adelaide Hills, SA. From a private garden, 3 varieties of excellent quality. Shelled. Or from Victoria. Pecans – NSW – awaiting new order. Shelled. Murray River Organics – Certified organic currants, sultanas and raisins, Vic. Barry Beach Organics, South Australia. – Wild harvested long pepper, cinnamon sticks and cloves from Indonesia plus the best organic, ground turmeric ever! Do Bee Honey – South Australian, unprocessed honey, 3 varieties: orange blossom, mangrove and cup gum. Sold in various size jars. Not Tonight Honey – Local, unprocessed Leatherwood honey, Prickly Box and Forest honeys, Woodbridge, Tas. Various prices and sizes. Cheeselinks – yoghurt cultures, Vic. Dairy culture and soy culture for Greek style yoghurt. Foolproof and very economical. $16 makes 100 litres. Books– for gardeners who want to grow food all year round, wherever they live. An ever evolving collection for the thinking, food gardener. 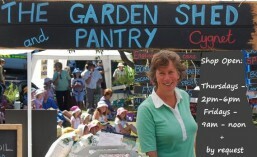 Don’t forget that I run a range of gardening and cooking workshops too. This Indian spice tin has a solid steel lid so that your spices are kept in the dark, which is important for keeping them fresh. Light can reduce the aroma and taste by 10% per week! Would love to buy the indian spice tins and clear lid container.